Thunder Matt's Saloon: The 2010 Chicago Cubs, Pay More for a Crappier Product! 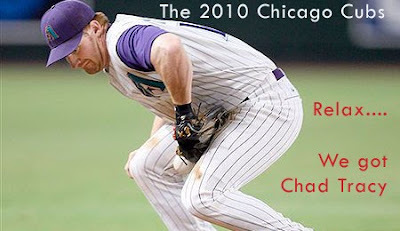 The 2010 Chicago Cubs, Pay More for a Crappier Product! So individual game tickets go on sale this Friday at 10am. Next to family birthdays and my anniversary, this is one of the single most important days of the year for me. I take a day off work for this. The exhilaration of getting in to buy tickets from the virtual waiting room is an immense high for me. Yes, I know how pathetic that may sound. So imagine my dismay when I read this article on Cubs.com. Starting Monday, February 15th at 10am CT, fans will have first access to all Chicago Cubs 2010 regular season home games by going to Cubs.com and paying a 20% premium on the face value of the ticket. Are you kidding me? Never mind a bleacher seat on a platinum date costs $54, and that's before getting punched in the face with taxes and fees, but now you can buy them earlier for $64.80. Nearly $65 for a general admission seat. The article does say there is a limit on how many seats will be available for pre-sale, so schmucks like me can still have the opportunity to be gouged at the normal face value on Friday. What's more frustrating is that if you recall this piece that came out back in early December, Cubs president Crane Kenney had this little gem. "This isn't the year to go crazy on ticket price increases," Kenney said. I'm curious what "going crazy" is then if he doesn't consider selling a bulk of the tickets at 20% over face value a bit insane. Perhaps to Crane "crazy" meant selling an internal organ or your first born child for tickets. Also from that December article was this snippet about the Ricketts plans for investing in the team. What helps the team now is that the new owners, the Ricketts family, plan on investing all profits into the Cubs, which wasn't the case when the Tribune Co. was the owner. Well that's a relief. So next season we should expect players with actual talent to be purchased with all the profits? I'll remember that when the Cubs sign yet another mediocre second basemen or right fielder next offseason. So thanks Cubs management for finding a new way to screw the fans. I guess you guys are at least a little more straightforward this time about scalping your own tickets. Remember when the bleachers were the "cheap seats"? That memory is fading fast. I remember the spring of '98, I bought $6 bleacher tickets to a night game. Well, Ricketts has a shitload of debt to pay off. I do think he has the team's best interests at hand. Prices are just going to be high while he cleans up Hendry's dookies off the field.